Universal Design for Learning (UDL) is a scientifically based framework focused on proactively designing environments for all learners. The framework has been adopted in learning environments throughout the United States and beyond. It is recognized in research and policy as providing a stable foundation for student-centered approaches. 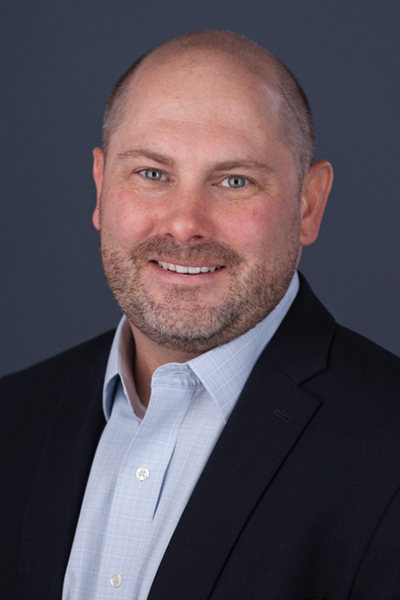 Dr. James Basham will provide an overview of UDL, discuss its role in the design of modern learning environments, and provide a high-level understanding of implementation. These topics will be contextualized across district, school, and classroom settings. Join us on Thursday morning, December 6 at 7:30 am to experience the Instructional Design Lab in the Blue Valley School District for this important conversation. 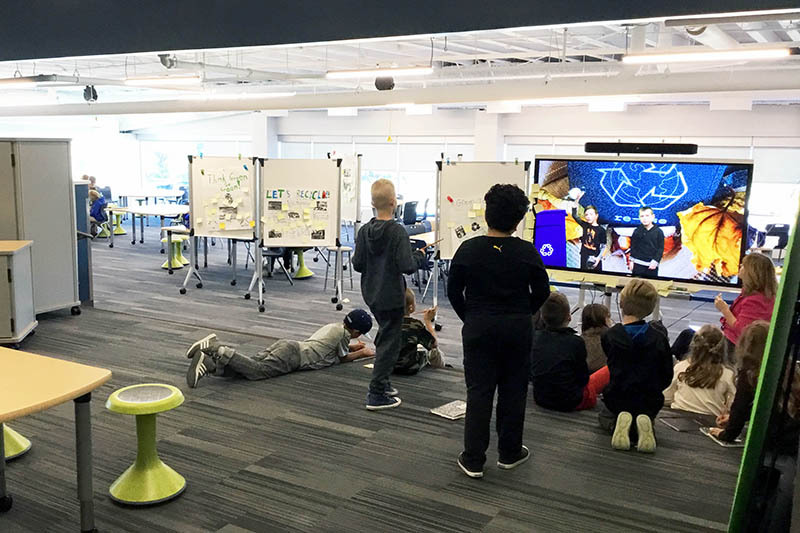 The Instructional Design Lab at Blue Valley’s Hilltop Campus is a space intended to unleash the inner creative genius and amplify learning for all who enter. In the lab, students and staff are encouraged to engage in the hard and messy work of creativity. Through the design thinking and project-based learning element of critique and revision, students experience a transformation of learning that results in higher levels of engagement and ownership. The goal is for every learner to embark on an epic journey focused on curiosity, self-discovery, collaboration, creativity, feedback, revelations, and empowerment as companions. We are excited to host Dr. Basham in a space focused on creative, engaging learning experiences. We look forward to seeing you for this important conversation and will have some time at the conclusion of the event to give our guests the opportunity to help steer the direction of our Kansas City Chapter in 2019. Please join us for this FREE EVENT on Thursday, September 27, 2018 from 7:30-9:00 am for a tour of the recently expanded and renovated Raymore-Peculiar High School. We'll begin this free event with a district presentation and design team panel discussion about the journey to include more innovative design elements into a fairly traditional comprehensive high school. Come learn how one fairly conservative community navigated the process to help expand student-centered learning opportunities. The Raymore-Peculiar community overwhelmingly approved a $27 million bond issue in April 2016 to implement a recently updated facility plan. The funds were utilized to expand and renovate Ray-Pec High School to accommodate an ever growing student population, while supporting a grade level reconfiguration to better utilize space throughout the district. The addition features an open-concept media center with ample natural light, meeting areas, a student-run coffee bar, and an adjacent culinary program. 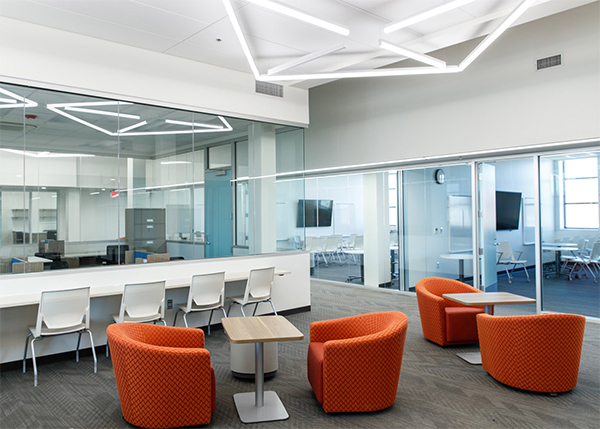 The two-story classroom addition includes a freshman center learning area with an administrative suite, a variety of lab and core classrooms, and a mass media production suite. Renovated areas include a large group collaboration space, a student-run school store, a life skills suite for students with special needs, and a renovated and expanded cafeteria complex. Also included in the additions are performing arts spaces and a storm resistant concrete dome gymnasium. Upgrades to various learning areas throughout the project support more 21st-century learning opportunities. The Olathe School District’s Millcreek Learning Center has been transformed to support alternative education options for both traditional and non-traditional students, as well as district wide support offices. The center’s main focus is the district’s high school and middle school S.O.A.R. program “S.O.A.R. (Students on an Alternative Route) assists students in achieving their highest potential through individual, flexible and structured educational experiences. One common goal all S.O.A.R. students share is to earn their High School diploma.” In addition to S.O.A.R., specialized classrooms for Credit Recovery for those seeking their G.E.D., as well as Extended Absence for students who miss large amounts of school due to medical requirements are provided. The transformation of Olathe’s original high school built in 1926, as well as two later additions built in the early fifties has created a dynamic learning environment where flexible classrooms and collaborative areas are combined to provide students with choice and ownership of their learning, even if their path is non-traditional. 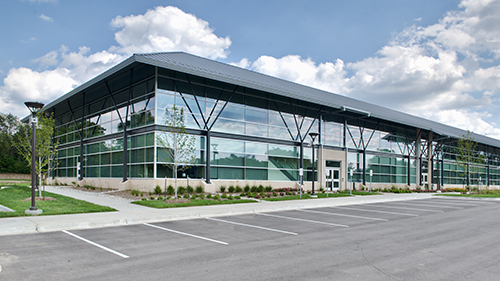 This unique facility also houses the offices for Olathe Community Development, The Olathe Public Schools Foundation, Parents As Teachers, and Assisted Transportation, bringing many resources under one roof. Join us on Tuesday morning, May 1st at 7:30 am to experience the transformation of the Millcreek Learning Center. This is a wonderful opportunity to see how existing space can be reinvented to support 21st Century learning opportunities and provide flexibility for the future. After breakfast and networking, a brief presentation will be shared, along with a discussion about the opportunities and challenges of this project type. After the presentation and discussion, the facility will be available for tours. The Kansas City Chapter invites you to “Quarterly Conversations” Breakfast on Thursday Morning, March 1st at 7:30 am for a tour of the Shawnee Mission School District Center for Academic Achievement. We’ll begin this free event with a brief presentation by Dr. Southwick and Dr. Ziegler, followed by a tour of the facility. 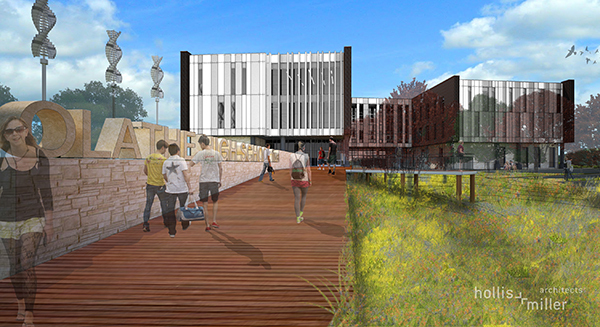 The Center for Academic Achievement takes a unique approach by intertwining spaces for education, community and administration into one building. Most of the building is dedicated to housing the district's Signature Programs. State-of-the-art equipment in a setting designed specifically for the programs creates real-life learning opportunities. It includes the award-winning Broadmoor Bistro, a fully operational kitchen and restaurant directed and executed by students. It’s open to the public for morning coffee and pastries, and also for Wednesday dinners. In addition to featuring multiple meeting rooms available for community use, the building is also home for the administrative team. With employee wellness being a key district initiative, the building houses an impressive workout facility for all employees. It also features a health center that staff members who have district health care plans can visit for medical care. In addition, surrounding gardens and walking paths promote a healthy lifestyle. This spring, a sustainable urban farm will be planted and maintained by students to be used in the culinary program's restaurant. The energy-efficient building offers collaborative learning spaces, integrated technology, tons of natural light and even a ‘living wall’ with live plants to clean the air and buffer sound. The 70,000 square-foot facility allows for daily interaction of school officials and students and allows the signature programs to be under one roof. The programs include: Animation and Game Design, Biotechnology, Culinary Arts and Hospitality, Engineering, Medical Health Science. Project Blue Eagle, which focuses on law enforcement, firefighting, EMT and legal professions, is located at another building to give students space to work with a firetruck and ambulance. The Missouri Innovation Campus is offering the country’s most accelerated degree program of its kind. 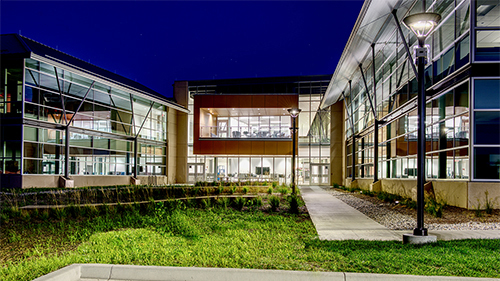 A progressive collaboration between the Lee’s Summit R-7 School District, Metropolitan Community College and the University of Central Missouri, the Missouri Innovation Campus is reshaping the way students experience education. Students choose between four degree programs; Systems Engineering, Software Development, Cyber Security & Drafting/Design. 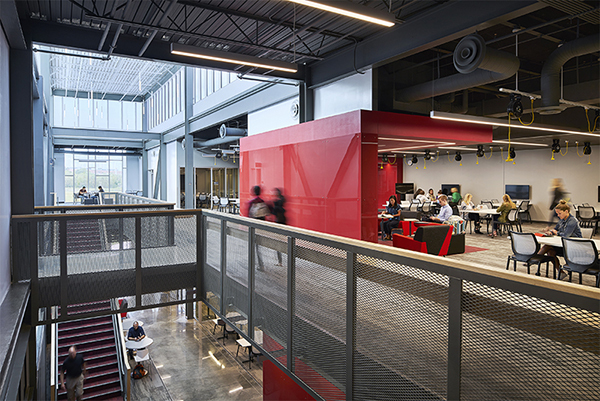 The innovative new facility allows students to receive their college degree on an accelerated schedule while collaborating with business professionals. 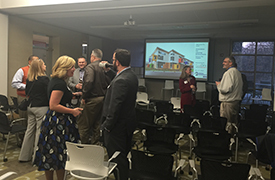 Please join us for this FREE EVENT on Friday, December 8 from 7:30-9:00 am at the Missouri Innovation Campus to explore the new facility designed around collaboration and unique opportunities for students. Preparing today's learners to be tomorrow's leaders is everyone's responsibility. Mastering collaboration, communication and strategic thinking are absolutely critical. An adapted approach to learning requires a mind shift for us all: Students. Parents. Teachers. Administrators. Facilities Professionals. Join us for an exciting conversation about developing supportive mindsets and behaviors in education and how to implement change at various levels in your schools and communities. This includes gathering diverse perspectives, breaking down silos, fostering communication and giving all involved ownership in the process. Whether you're an educator or a designer, are starting a program or project from scratch or are adapting an existing approach, this topic is essential for success in creating engaging curriculum and inspiring spaces for learning. We're excited to welcome Sudhakar Lahade as our Thought Leader. He is a Senior Consultant in Applied Research at Steelcase and an architect-design thinker-business strategist by profession. His passions are research, education, design-thinking and innovation. Please join us for this FREE EVENT on Friday, September 29th from 7:30-9:00 am at the Johnson County Community College CoLab, located in the heart of the JCCC campus. The CoLab provides many resources that support students, faculty and community partners to create collaborative, experiential learning opportunities. 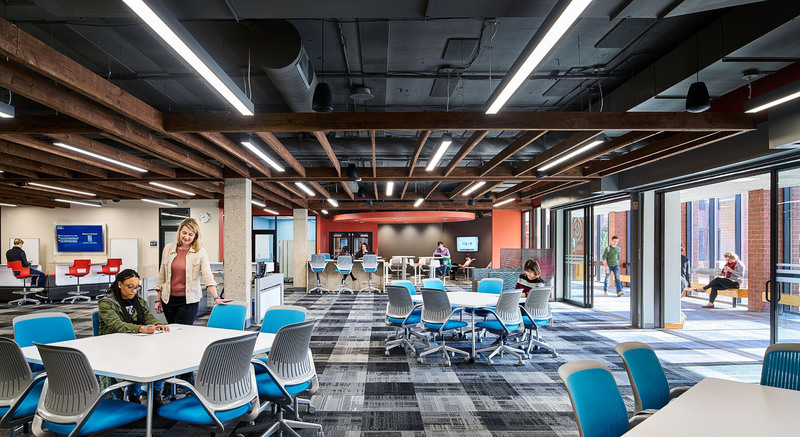 It's an active learning environment offering an array of resources – imaginative co-work spaces, advanced technology, technical support, research assistance, event coordination – all focused around student success. The CoLab is located at Johnson County Community College in the OCB building, download map. Join us on Wednesday morning, April 26 at 7:30 am for a tour of the new Olathe West High School. We'll hear from the building's administrators who were involved from the start on how this project was designed to enhance curriculum, challenge the idea of what high school looks and feels like and create a space for modern learners. After a Q&A session, the building will be available for tours. Olathe West High School transforms learning into an environment that intrigues the high school mind, stimulates creativity and collaboration amongst students, facilitators, and community. In this unique setting, teachers will become learning coaches, serving students and facilitating learning through a variety of spaces and tools. Teachers won't own their rooms and instead will be a part of a neighborhood, breaking down the scale of the school and allowing for more personalized learning and a wide variety of delivery methods. Opening in August of 2017, the new facility will allow students to explore and develop skills through inquiry and curiosity in a shell that blends context and outcomes. Learning will occur through real-world simulations and problem-solving applications tackling current and future global problems and will collaborate with businesses, the community, and globally with other students abroad. Join us on Wednesday morning, February 22 at 7:30 am for a tour of the Blue Valley Early Learning Center. We’ll begin this free event with a kick off video about high quality early education environments and Kendall Burr, Principal, Early Childhood Programs, will share her insight on the project. You’ll hear and see firsthand what has been a success with this exceptional learning environment in a non-traditional building and how these students are discovering and learning to their greatest potential every day. What is the Hilltop Learning Center? The Blue Valley Early Childhood program impacts nearly 900 children per year with developmental screening, speech/language services, community intervention, and classrooms. Within our 26 classrooms, we serve approximately 350 students each year. Our classrooms serve 3-5 year olds, about half of whom have a delay or disability. Within each classroom of approximately 12 students, half are students with an Individualized Education Plan and half are students who enroll as typically developing peers. Students attend for 4 half-days per week, following the school calendar. Our classrooms are served by certified early childhood special education teachers, paraeducators (classroom assistants), speech language pathologists, and occupational therapists. Other services such as physical therapy or services for children who are visually impaired are available as needed by individual children. Nearly all of our intervention takes place in the context of naturally occurring classroom routines. 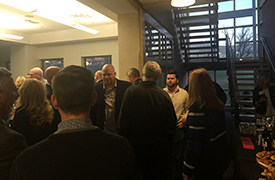 What is the Northland Innovation Center? The SAGE (Students in Academically Gifted Education) Program serves academically gifted K-5 students in the North Kansas City School District. SAGE allows gifted students to become independent learners and decision makers who recognize their potential and responsibilities in a changing global society. The SAGE Center is a student-centered, open-concept learning environment. Participants in the program work in a one-to-world computing environment where they utilize technology in a transformational manner to share, create, and present to others. During the SAGE day, students engage in real world problem solving, mathematics, affective, Spanish, creative problem solving, and independent study. Examples of elementary units of study offered at the SAGE Center include: 3-D printing, broadcast journalism, NASA Engineering, drones, orienteering, zoology, epidemiology, forensic science, Arduinos, and PIXAR animation. Join us on Wednesday Morning, December 7th at 7:00 am for a tour of the Northland Innovation Center. We’ll begin this free event with a kick off video about Individualized and Project Based Learning and the Coordinator of Gifted and Innovative Programs will share her insight on the project, along with staff. You’ll hear and see firsthand what has been a success with this out of the box learning environment in a non-traditional building and how these students are discovering and learning to their greatest potential every day. Thank you to all who attended! Light hors d'oeuvres and drinks will be provided. Click here to read the letter from the President, Bradley Kiehl.